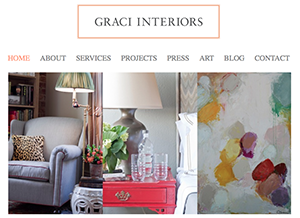 Design Burd Inc.Defining Elegant Interior Design | Design Burd Inc.
Graci Interiors has always had a traditional, glamorously approachable look. Which is what, we, at Design Burd implemented to their new website. Almost an all white layout with beautiful imagery, the hint of the muted tangerine color brings all pages to a subtle whole. We're happy to hosts and maintain this site for them.